It’s exciting to be a filmmaker and videographer these days. Versatile cameras, affordable LED lights, and powerful editing software. This list also includes the slider which allows us to make camera moves, though short ones, without all that dolly track and a big, heavy dolly. Back in the day when I gripped, I laid and leveled a lot of track and did tons of camera moves. And one thing that’s clear to me today is, though a heavy dolly on track carrying a DP and AC is very different animal than a slider on a tripod, there are certain fundamental practices that are common and important to using both. For a dolly move on the floor or track, we mark start/stop points on tape on the floor. But what about sliders? Most moves have a start and stop point, and some even have pause points in between if your actor stops and starts again. When I dolly grip, I make marks on the floor with tape. For a slider, you could use marks but if you’re doing the move yourself, marks may not be possible because you’re focusing on the shot. Here’s a trick camera operators use. To keep this simple, we’ll use a shot with the pan and tilt locked off. For a left to right slider move, we’re checking the left edge of our starting frame. We’ll come back here for the beginning of each take. If you’re doing a camera move from left to right, check what’s on the left edge of your starting frame. That’s your first position mark. For your end shot, check what’s on the right edge of your end frame. That’s your final position marker. The edge of the door is the far right edge of our final frame. We start to slow down the slider and stop at that point. 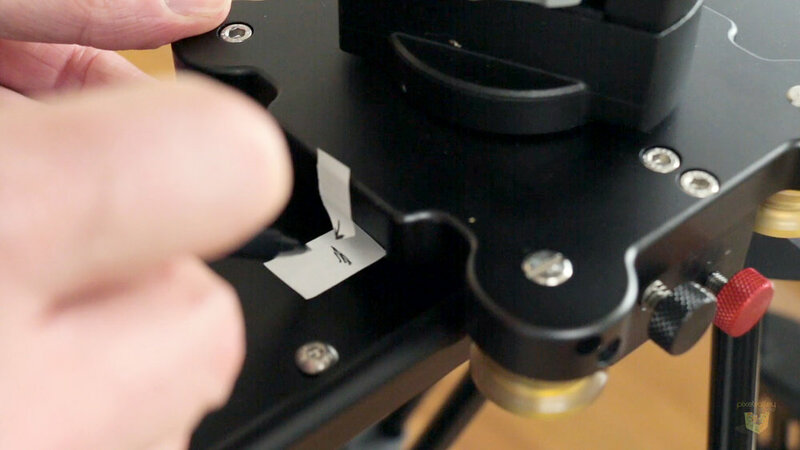 For the end frame, you’ll also need to pay attention to some mark on the right edge before your final mark. It lets you know you’re end-frame is coming up. Some operators use an object on the trailing edge, the left side in this case, for their mark. This way they see the object in their frame as it comes closer and closer to the edge, letting them know to begin feathering down to a stop. In this case, the lamp on the desk is our mark. Since we’re performing a left to right slider move, it may be easier to watch a Left end frame mark. Why? Because we can see it coming closer and closer to the edge of the left frame and begin feathering to a stop. The reason, something we call feathering. Whether on a dolly or slider, you don’t what to abruptly start or stop a shot but ease into them by ramping up to speed and then ramping down. It’s especially important on the end shot as slowing down to a complete stop on the correct mark, without unwanted camera jerking, can be tricky. Feathering at the start and stop of your move means slowly building up to speed, maintaining that speed for the shot, then slowing down gradually to a stop. If you have someone to help you with the move, especially if you’re panning and tilting your shot, they could use marks. What I do is hang a pointer from the slider and then mark the in and out points on the base. 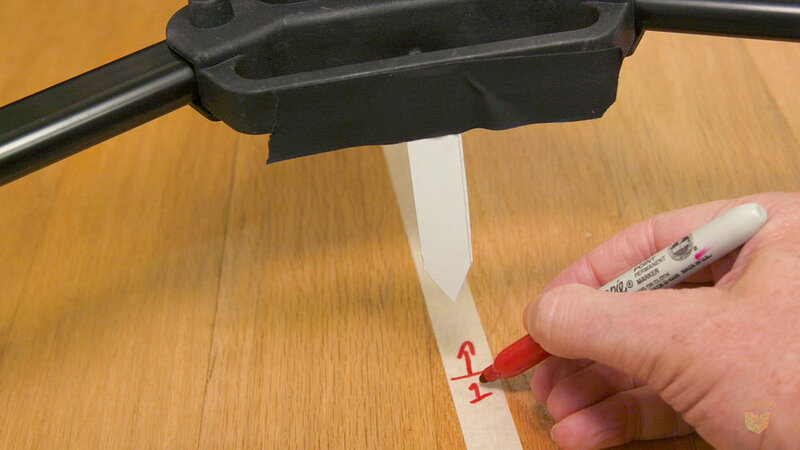 Taping a pointer to the slider base that points down to our starting mark. For our end mark, it’s important to “see it coming” so we make it longer, like a T. This gives us time to slow down (feather) to a stop. Note that it’s important to mark them from where you will physically be standing, otherwise your viewpoint will give you an incorrect position. And I make a sideways t-mark to let me know to start slowing down. One nob to lock the other to adjust the tension of the move. When pushing a dolly, I have plenty of resistance to create tension because of its weight. But with a DSLR on a slider, it can be moved almost too fast. Adjust the tension to fit the speed of the move. It may take a few tries to dial it in. Our tension knob helps us not move to fast or too slow. Sliders can be light so adjusting the tension helps us maintain our movement speed. Now greasing the track. Dollies where heavy and depending on the conditions of your location, we had to lube up the track and wheels. What did we use? Good old furniture polish. I rarely need it on a slider but if you do, wipe the track and wheels first. Don’t spray directly on it but onto a rag away from the camera or make sure the lens covered. Then wipe it on the track and wheels. Motors are great but when you’re following the action, an actor is not a robot. Moves may change and you’ll end up with a move that’s slightly different each time. Check your bubble level regularly. Just moving the tripod rig a few feet can put it out of balance depending on the floor. Balance it again. Floors, especially in older houses, our notorious for being off level. 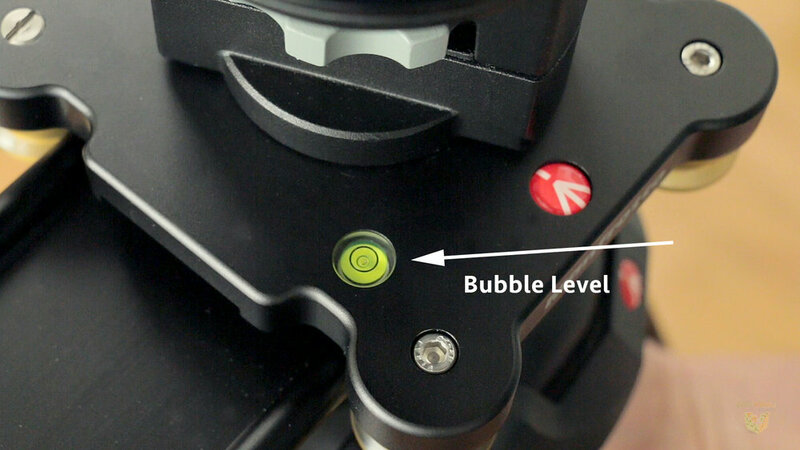 Check your bubble level every time you move the slider rig and adjust if needed. Also, on some tripods, the legs may give a little under the offset weight. I had a shot slowly go crooked during takes. Ends up one tripod leg was going loose due to the weight of the C100. I had to tighten the leg lock with its allen wrench and rebalance. Sandbag the tripod legs. You’re sliding an object back and forth horizontally on your legs and they will want to rise up. They’re not really designed for that type of movement.